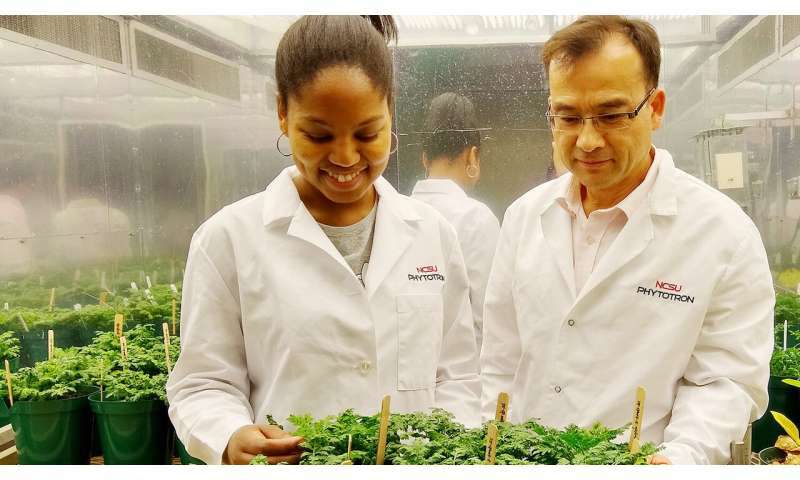 De-Yu Xie, an NC State professor of plant and microbial biology, and graduate student Rika Judd study the sweet wormwood herb. Xie had for years been skeptical of the conclusion that artemisinin production was limited to GT cells – in other words, that GT was required for artemisinin production – and Judd sought proof of his hypothesis. So Xie, Judd and collaborators in NC State's chemistry and plant and microbial biology departments used a number of techniques – genetic, gene expression, metabolomics and microscopy – to show that non-GT cells in both self-pollinated gland-bearing and glandless mutant A. annua plants have the capacity to produce artemisinin. The findings appear in Molecular Plant. "Non-GT cells are more important than GT cells to provide a sufficient amount of artemisinin because the GT yield in the plant is generally very low; GT is about 2 to 3% of the dry weight of the plant," Xie said. "We want to try to increase artemisinin content, and now we can try to do that through non-GT cells," Judd, the paper's first author, said. "We want to find a technique in which we can see what particular cells make artemisinin in addition to GT cells – and target those cells. Hopefully this finding will help our lab and other researchers develop new technologies to supply the high demand for anti-malaria drugs." "I hope this paper will reshape research methodologies, hypotheses and practical applications on artemisinin in the future, so we can help billions of people who live in malarial risk areas," Xie said. "That means using new technologies to produce 100 or more metric tons of artemisinin per year and at a lower price."